Chris Calloway (9/21/1945 – 8/12/2008) was the daughter of big band leader Cab Calloway and I got to see and photograph her many times during her several appearances at the Fairbanks (Alaska) Summer Arts Festival. 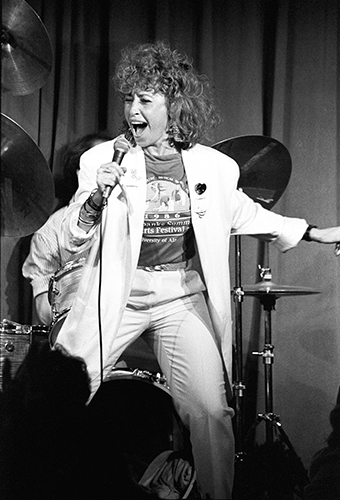 This was her performing after her cabaret students performed at the Palace Saloon in 1986. During the several years I was the “official festival photographer” I had access to all the big “stars” that taught and performed but I can easily say, no single performer could light the stage up as quickly and rock the audience as thoroughly as Chris at the Festival.